At WMTS 2019 in Booth 213, Mazak Canada will offer live demonstrations of Multi-Tasking capabilities and SmoothG controls to attendees in industries including oil and gas. Machine demonstrations will feature two machines manufactured in the company’s award-winning Florence, Kentucky facility. The VTC-300C Vertical Machining Center with automatic tool changer and the QUICK TURN 450M CNC Turning Center with Multi-Tasking capability both include MAZATROL SmoothG controls to target efficient production in applications such as complex downhole components, pipe control valves, pumps and wellhead equipment. With the SmoothG CNC control, operators can use either EIA/ISO or MAZATROL conversational programming to process complex parts through off-centerline machining, angled drilling, milling and tapping. A 19″ multi-touch screen with intuitive input and ergonomic tilt control presents all critical machine data in a one-page view. Advanced SmoothG programming functions for high-speed, high-accuracy machining include High Gain Feed Forward Control to boost machining speed and accuracy, Variable Acceleration Control to calculate optimal acceleration for multiple axes and Real Time Tuning to balance workpieces as their weights change. The QUICK TURN 450M CNC Turning Center with Multi-Tasking capability reduces equipment and labor costs per part, with milling capabilities (M) along with a standard 7.28″ spindle bore capacity for a variety of through-hole turning applications. A standard 50-hp integral turning spindle motor enables the machine to process diverse medium or larger-diameter parts. Machine design minimizes vibration during heavy-duty turning for exceptional surface finishes and long tool life. The integral spindle/motor delivers more high-efficiency power to the tool tip through a design with no transmission belts, pulleys or gears. Mazak Corporation is a leader in the design and manufacture of productive machine tool solutions. Committed to being a partner to customers with innovative technology, its world-class facility in Florence, Kentucky, produces over 100 models of turning centers, Multi-Tasking machines and vertical machining centers, including 5-axis models. 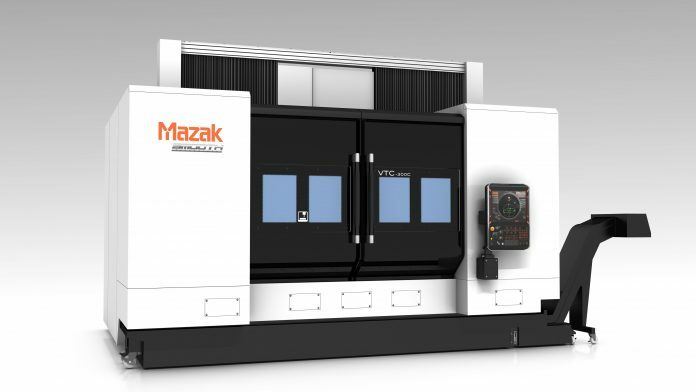 Continuously investing in manufacturing technology allows the Mazak iSMART Factory™ to be the most advanced and efficient in the industry, providing high-quality and reliable products. Mazak maintains eight Technology Centers across North America to provide local hands-on applications, service and sales support to customers.